Baby it’s cold outside. At least it is cold here and we are expecting snow next Monday. Brr. 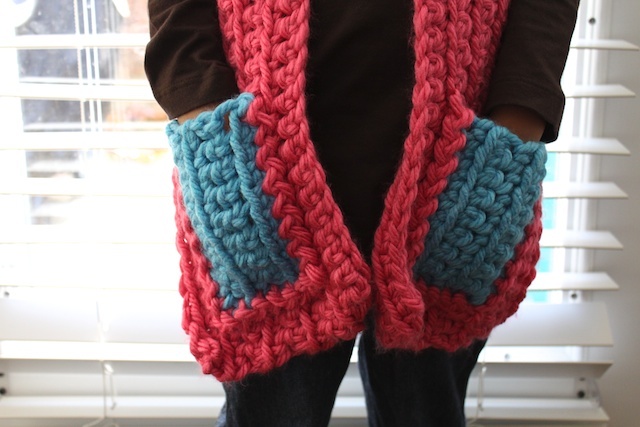 Last year I started making these chunky pocket scarves. Never finished them. So this year, I decided to pull out the old project and finish them. Then wrapped them up for Christmas gifts. I love these scarves because they are so soft and warm. And they are multifunctional. 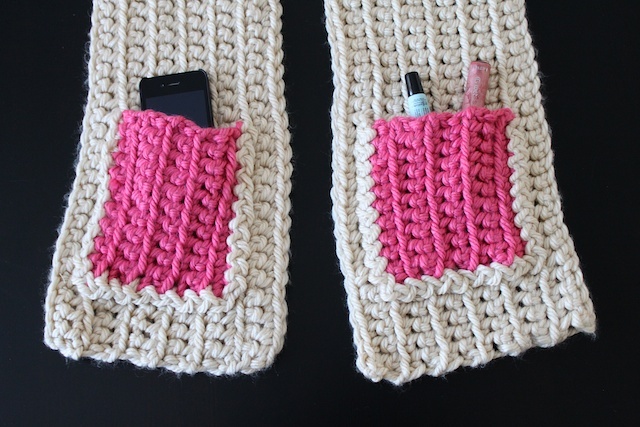 Use the pockets to put stuff in or to keep your hands warm outside. I ended up making four of them. One for me, Kaye and Nathan. All at various sizes because of our heights. And then I made an extra to giveaway to a friend who will be leaving for college at a very cold place. I also enjoy doing crocheting projects because it is something I can do while watching TV. It’s quite relaxing for me. 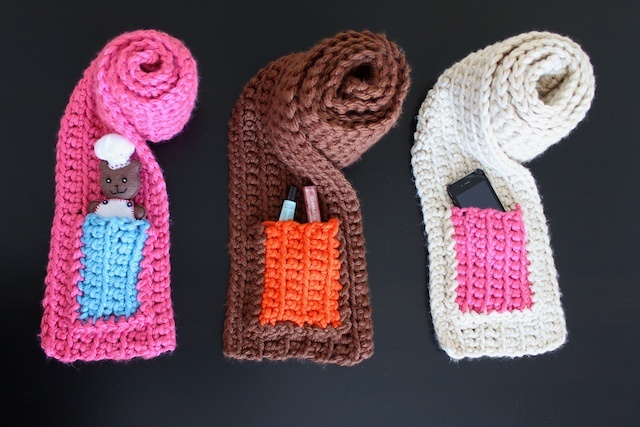 And these scarves are pretty easy to do. Mostly just straight lines and counting your stitches. » Tell me… Are you a scarf person? Do you make your own or where did you purchase your favorite scarf? Cute, cute, cute! Great idea! Your scarves are gorgeous! I’m “down under” in Australia and in the middle of Summer, so usually winter-y christmas gifts are out of season which is such a shame. These would make great birthday gifts though. I love buying scarves and there is nothing better than when someone spends the time to make a scarf for you. Can you please tell me, I’m not great at crochet, did you follow a pattern? it’s really simple just doing straight lines until it’s long enough and wide enough. same for the pockets. then zig zag crochet it together. Love this! Oh how I wish I could knit! Did you sew the pockets on? Love these! Want to make them for the boys! 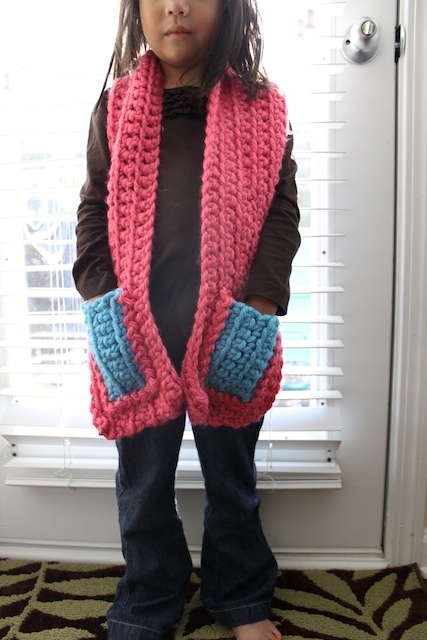 no, i did a zig zag crochet to attach the pockets to the scarf. 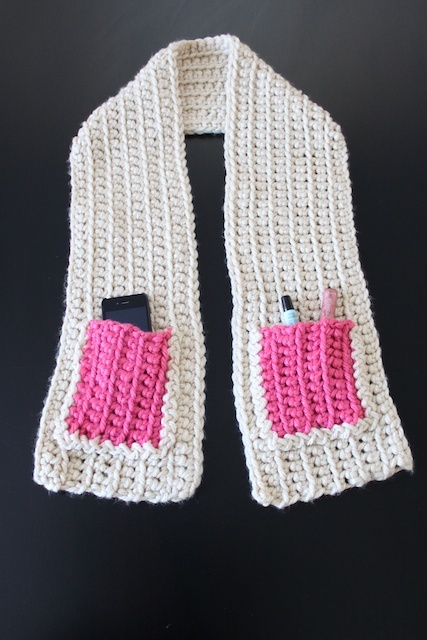 it’s the zig zag crochet is the same color as the scarf. less noticeable. Love These! You have to sell them… please! could you please post the directions! Thanks! Would love the directions for these scarves! Is there a pattern for this? I am a beginner but am in love! Please, Do you have a pattern for these scarves? Or at least post what size of hook and yarn? Thank you! 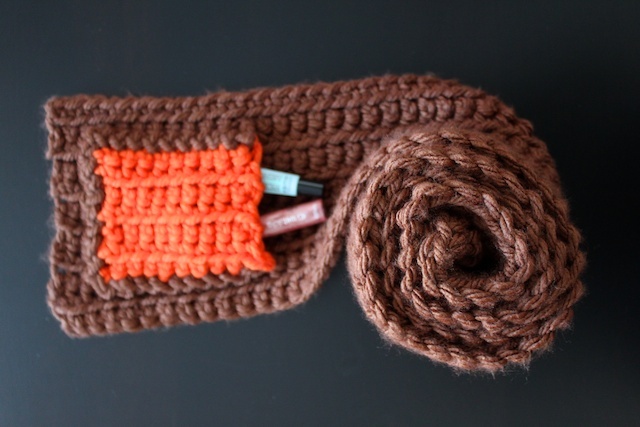 I love to have the pattern for this scarf! thank You! could you please share what kind of yarn you used and what size hook? ?Thanks..